Five Nights At Freddy’s may have totally failed when it came to the release of Five Nights At Freddy’s World, but that hasn’t stopped developer Scott Cawthon from continuing to do what he loves. With the newest game from the developer, being referred to as only Sister Location for right now, we’ve only been handed one tiny teaser. But now we’ve finally got another hint as to what Sister Location is going to be about. 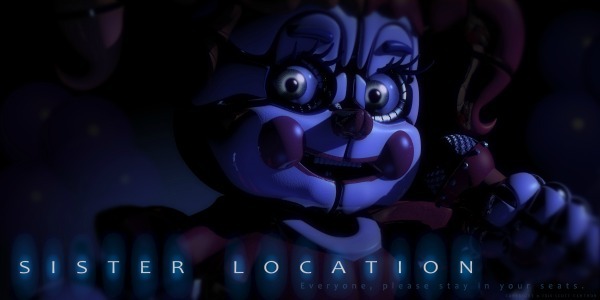 The image obviously depicts a new animatronic with the face of a clown, although much more detailed and horrifying than the last teased image. It was posted with the phrase, “Everyone, please stay in your seats.” That has to be a reference to an amusement park ride. Before a ride, the staff running the ride will tell riders to please remain in their seats. But still there are very little details as to what the game will actually entail. There have been a number of speculations as to what the new image might indicate. According to Touch Arcade, some on Reddit have said that it could be related to the pig-tailed girl from Five Nights At Freddy’s 4. Others pointed out it might be a relation to the novel The Silver Eyes, an official Five Nights At Freddy’s horror novel. Surprisingly, I’ve never really gotten into the Five Nights At Freddy’s games, and I say it’s surprising because I’ve heard many horror fans rave about it. I guess I don’t go looking for the jumpscare games. I think I like the games that are more in-depth and story-driven with vast environments and atmospheric horror. But then again, I’ve never played Five Nights At Freddy’s, so I can’t speak for the game. While there isn’t much known yet about the new game from Scott Cawthon, we can hopefully expect it to be as chilling as his earlier games, because clowns are absolutely terrifying. And we’ll hopefully get some more details as E3 rolls around in a few weeks.